During the summer, a nice selection of our Grand Sturdy program is ready for viewing in the showroom... Walk in and sail away. Summer is not only the time to sail over the waters of Europe, but also the time to visit Linssen Yachts in Maasbracht. Our showroom is open from Monday to Saturday*. We welcome you to our showroom with our ‘Upper Deck Summer Cocktail’. From our Upper Deck you look out over the showroom, where this summer almost our entire new build program is set up. Whether you come for our compact 30.0 or 35.0 (AC/Sedan), the particularly spacious 40.0 (AC/Sedan), the 45.0 ultimate travel boat or our flagship the 500 AC Variotop, between 9 and 15 meters Linssen is the place for you. 12V. sternthruster 55 kgf (3 kW / 4 HP) including additional maintenance-free 90 Ah starting battery. Cabrio closed model over the complete aft deck, Sunbrella Dune. The side- and back parts can be opened by a zip-fastener (AC). I am interested in the Grand Sturdy 30.0 / 35.0 Summer package. I am interested in the Grand Sturdy 40.0 / 45.0 Summer package. I am interested in the Grand Sturdy 500 Summer package. I would like to come to Maasbracht for information about the special Summer package. Contact me for an appointment. 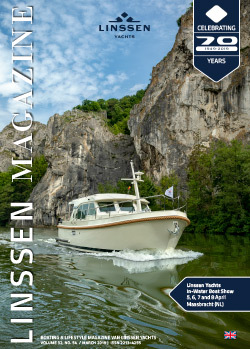 I would like to receive more information on Linssen Yachts. * Check our website for the opening hours during the summer holiday. Registration of your visit is not necessary, but can be useful if you have specific questions. ** This offer is not valid in combination with part exchange and is not redeemable for cash. This offer does not apply to brokerage yachts. "Es besteht keinen Zweifel daran, dass dieses besondere Boot als zeitlos-elegantes Aushängeschild von Linssen jeden Cent wert ist". Skriv in er mejladress nedan för att få vårt digitala nyhetsbrev. Nyhetsbrevet kommer hålla er kontinuerligt uppdaterad om ny utveckling, utställningar, event, mm. I varje nyhetsbrev finns också en länk för avregistrering.